Tampa Bay Fishing October Report. October is here and our options are endless. Water temperatures started to fall last month and will continue. October is one of my favorite months to fish. The weather starts to cool, the redfish bite is going off, snook are on the move back from the passes, trout continue to keep rods bent, grouper start their move closer, mangrove snapper are still around, and the mackerel (King and Spanish) invade Tampa Bay waters once again. Why wouldn’t October be everyone’s favorite? The redfish bite was awesome last month and will continue to be hot this month. With pre- and post-spawn fish everywhere, you pick a spot that looks fishy and it will almost always hold some redfish. The redfish have been taking live white bait (scaled sardines). The key is to have plenty of bait to keep the redfish chummed up and interested. I have been fishing a 24” 25lb Trilene fluorocarbon leader with a #1 Daiichi circle hook under a cork. They will also be willing to eat most cut baits. Pinfish, threadfins, mullet and lady fish are good choices. If artificial is your thing, top water plugs with a mullet pattern would be my choice. 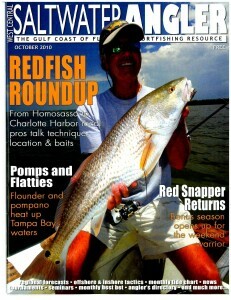 Most areas fishing Tampa Bay will hold redfish from the Kitchen to Joe Island. The Kitchen and around the Alafia River are holding some nice fish. Seems like a broken record, but it holds true again this month. Fishing trout in Tampa Bay has been phenomenal and will continue as temperatures drop. Look for any grass flat with good tidal flow and a good source of bait, and you are sure to run into some trout. Live white bait (scaled sardines) fished under a cork will do the trick for the live baiters. If you want to learn to throw artificials, trout is a good species to start with. They are easily fooled and are willing to eat most baits. A go to bait for beginners is a Berkley Gulp! fished under a popping cork. Get about 18” of fluorocarbon leader, 1/8 ounce jig head, and a cork, and you are good to go. Just cast out, pop the cork every couple of seconds, and continue until you get a bite. This will be the last month to harvest Tampa Bay Trout. Season will close November and December. Snook season is officially closed. The FWC had its meeting last month and decided to keep the season closed on the west coast until September 2011. They have opened season on the east coast for September, October and November. They will close it in December and keep it closed until September 2011. I believe they made the right decision. We got hit hard this winter and our snook population has been depleted. I did have some encouraging charters around the downtown and Alafia River last month. While we were fishing for redfish, we got into some small snook. It looks like the spawn went good and the newly hatched fish have made it to the back country. If we can get through this winter, we will be on our way back to normal in a couple of years. We started to see the mackerel bite come on last month, so look for them to start to show up in good numbers this month. Tampa Bay fishing has plenty of good areas for mackerel. Ship channels, range markers, and artificial reefs will have mackerel around them. A chum block, some live threadfins, or white bait, and you have a good recipe for mackerel. Look for the grouper to be moving in a little closer into our region. Live or dead sardines will be sure to get the bite going. Any of the ship channels in Tampa Bay should hold some grouper. The Skyway Bridge will also be a good place to find fish. While you are at the bridge, be sure to have a rod out for kingfish. If temperatures cooperate, we might see some kingfish make their way into Tampa, and the Skyway is a good spot. The mangrove snapper bite has been a little off this year in our region, but there are still some fish to be had. Any rocks around downtown to Apollo Beach may hold fish. Light leader and a small hook is a must. To book a Tampa Bay Fishing Charter, call Tampa Bay fishing guide Capt. Will Shook.